Home » Around NYC » Carter Burden: What's In a Name? Carter Burden Center for the Aging extended its highly regarded programs to Roosevelt Island, last year. Roots run deep in the organization and growth now brings a fuller bloom. At noon on Wednesday, May 5th, the Carter Burden Center for the Aging staged a noontime event at the Senior Center, celebrating their transition into the Carter Burden Network, a more appropriate title that recognizes their growth in serving a broader New York population. "BIG NEWS: William Dionne, our Executive Director, would like to invite you to join us in celebrating the launch of our new name, brand and vision for the future of aging services in New York City,” the notice read. Click to see a photo gallery from the event. That announcement reverberates back to the ideals many in my generation held dear and expected to see fulfilled by now. That they haven't been hasn't been due to a lack of virtuous muscle from folks like Carter Burden. Yes, Carter Burden was a real man, an idealist who worked for Senator Robert F. Kennedy, one of my heroes, until he was assassinated. Not bowed by despair, Burden - only twenty-sever years old, at the time - came home to New York and quickly won a seat on the City Council, representing (roughly) the district now held by Ben Kallos. As the New York Times wrote, remembering Carter Burden in 1996, "...he served as chairman of the committee on health, fought to protect children from lead-based paint poisoning, sought to better the health and housing of the elderly, advocated the establishment of standards for prisoners' rights and introduced one of the first gay rights bills in the country." Burden always seemed to be a step or two ahead of the ideas of his progressive contemporaries, but he went a step further. Recognizing a neglected population of seniors living in his district, he did more than promote and discuss. With a single social worker, in 1971, he created the Carter Burden Center in an Upper East Side storefront. 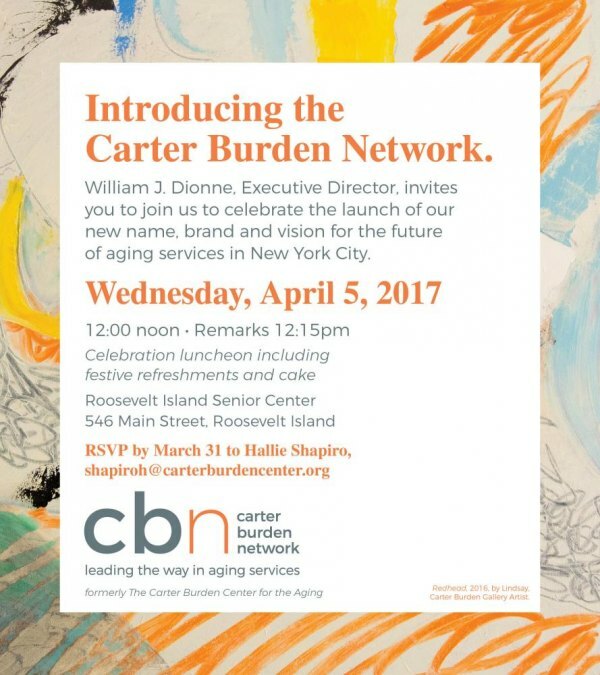 Later, "for the Aging" was added, and now after fifty years of creative service to seniors and outreach that includes many additional centers, it's been shortened to "Carter Burden Network." Answering the call to rescue the troubled senior center at 546 Main Street, Carter Burden Center for the Aging hustled to assemble programs, from free lunches to birthday celebrations and exercise classes, in July of last year. The upgrade exceeded expectations, bringing in Lisa Fernandez's steady hand in leadership, charismatic Hallie Shapiro's welcoming outreach and and the steady personal guidance of case manager Yulisa Santana. These three reinvented the Roosevelt Island Center, invigorating it with fresh programing and accountability, winning outspoken praise from Judy Berdy, our community's most dedicated volunteer, and Jane Swanson who recognized their cooperation in opening doors for Cornell Tech to connect with the senior population here. We've been lucky to catch the downstream influence of a tradition started selflessly by Carter Burden. In a conversation, Burden's widow Susan recalled visiting Roosevelt Island during its earliest days as a community. Her husband, she said, loved coming over to walk along the waterfront. Little did he know, that his affection for Roosevelt Island and for seniors would one day merge in a center providing robust services to elders at 546 Main. Now that it has, why not stop by around noon on Wednesday and share in the celebration? See you there!